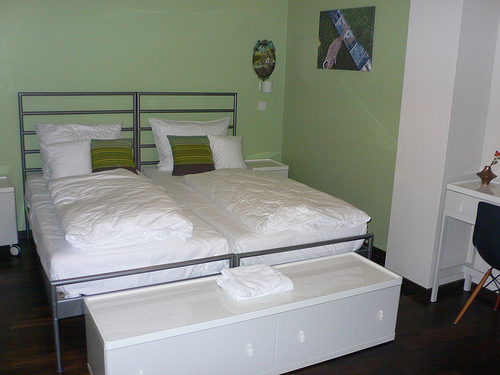 If you’re looking for an apartment in Berlin that you can rent by the night, or a stylish contemporary boutique hotel that won’t break the bank, or a cool backpacker’s hostel, Circus Hotel and Hostel in Berlin will fit all your lodging needs. I’d first heard about the well established Circus Hostel just across the road from the newer Circus hotel and was attracted by the apartments that are available in both the hostel and hotel, hoping for some privacy for myself, my daughter and her friends, while providing a youthful environment for the teenagers. We eventually settled on a four person apartment in the Circus Hotel for the teenagers and a room for myself in the main hotel. 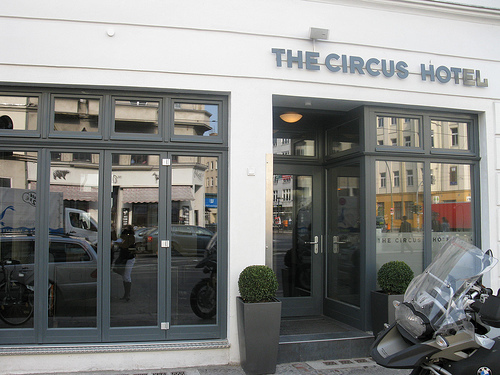 The Circus hotel and hostel are very easily accessed by train from the airport and the S-Bahn station at Rosenthalerplatz is right outside the hotel. 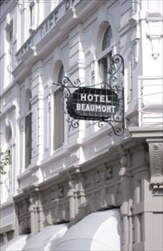 Circus hotel is housed in an old building that was once a tailoring store but was renovated and re-opened as a hotel in October 2008 in modern but comfortable boutique style. The apartments are through the courtyard towards the back of the hotel and the teenagers were thrilled with the two good size bedrooms and two shower rooms as well as a small sitting area and well equipped kitchen. The decor was modern with quirky touches and kitch accessories which gave the apartment bags of personality. My hotel room across the courtyard was slightly more sophisticated in neutral shades of taupe and marine blue with accents of turquoise, leather and bamboo furniture and modern prints on the wall. The shower room was in the same neutral tones with a large walk in shower and large mirror and although the room faced the street, it was double glazed to minimise the street noise. The hotel operates a policy of sustainability, using eco-friendly products, supporting local producers and suppliers and reducing waste wherever possible. As an example of this, the hotel rooms do not have mini-bars to save energy, supply tap rather than bottled water and miniatures of natural Weleda toiletries are available at reception but are not left in the hotel rooms. The hotel also thoughtfully provides many services such as loan of DVDs about Berlin, loan of I-pods with carefully selected music for your stay and offering many public transport options for guests from bike and Segway rental to public transport tickets. The other outstanding feature of the Circus hotel is the super-friendly young staff who are brimming with enthusiasm and go out of their way to offer help and advice on things to see and local restaurants and bars. 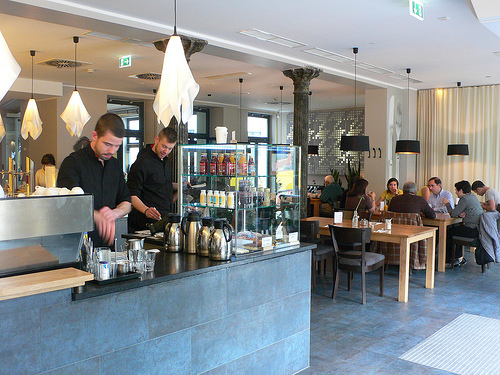 We also enjoyed eating in the Fabisch restaurant downstairs which is open to non-residents and offers German favourites with a modern twist, using local and seasonal ingredients wherever possible and there’s a reasonably priced daily special at lunch-time. We also felt very relaxed on the squashy leather sofas in the bar area where they make outstanding cocktails too. For the stylish, modern ambiance and warm and welcoming service, I thought the Circus hotel and apartments were excellent value with rooms starting from €80 per night and a 2 bedroom apartment for 4 people from €160 per night. Centrally located, moored on the River Spree and close to the lively areas of Kreuzberg and Friedrichshain the ‘hostel boat’ Eastern Comfort, was the first of its kind in Berlin. With a choice of single, double, triple or four bed cabins there is a choice for every budget traveller who wants the affordability of a hostel, but with a little added luxury and a touch of the unusual. Despite being on the water, the Eastern Comfort is a fully equipped hostel, featuring a laundry room, WIFI access and a TV room/common area. Even a mini bar is available (on request) in first class cabins. 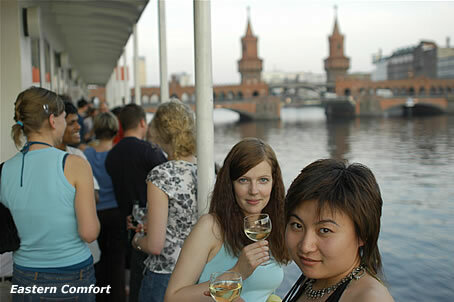 A lounge/deck area, with views over the river and central Berlin is connected to the bar, which serves beer, snacks and full meals as well as organizing English and German parties in combination with regular events such as ‘language night’. The boat is conveniently moored close to the Oberbaum Bridge, just a few minutes walk from the Central Station and metro which serves the entire city. In such a confined space the Eastern Comfort may not be a good option for those looking for a quiet few days, but for anyone who wants a lively atmosphere, the hostel boat is the perfect base for exploring the sights of Berlin and its famous nightlife. First-class single/double cabins (on the upper deck), with en suite facilities are available for €64/€78 while second-class single/double cabins (on the lower deck), with en suite facilities are priced at €50/€58. Shared dormitory style rooms start at €16, or for those on a true shoestring camping on the upper deck is possible for €12 per night. More information is available on the Eastern Comfort website.